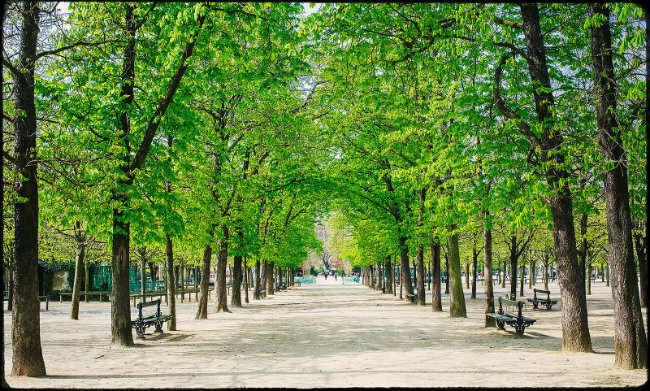 There’s a reason so many songs and poems have been dedicated to Paris in the springtime. The trees are in blossom, the daylight lingers longer, the café terraces fill up with Parisians heading out of winter hibernation. Even a little rain can’t dampen our spirits! 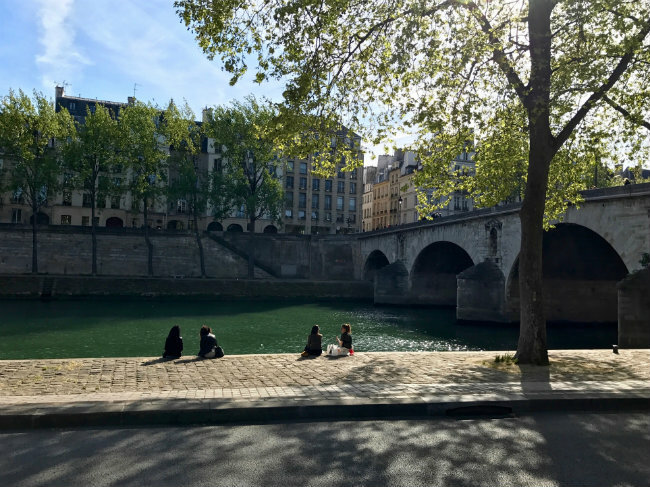 Here are some tips on favorite things to do in Paris in the springtime, as recommended by our expert contributors. 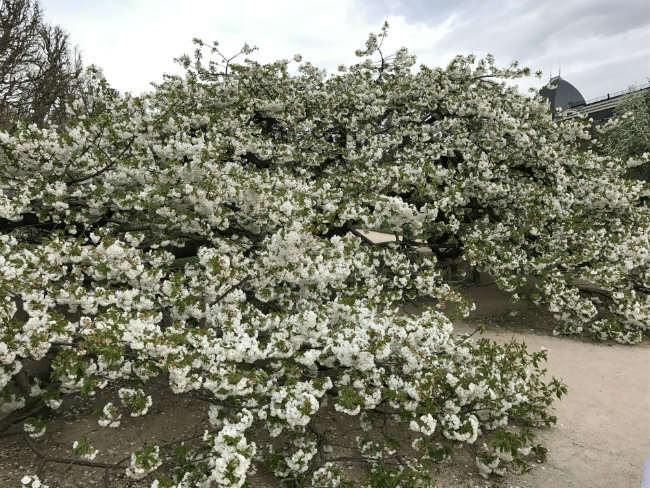 Each spring, I make a pilgrimage to the Jardin des Plantes Japanese cherry tree, whose limbs sweep the ground in a grand gesture of delicate white. You can step inside and lose yourself in a swirl of spring. This tree blooms before most other cherry trees in the city, so you have to stay in touch with the rhythms of the season. — Meredith Mullins is an internationally exhibited fine art photographer and instructor based in Paris. There are few things more quintessentially Parisian in the springtime than the city’s iconic landmarks accented by delicate pink cherry blossom. 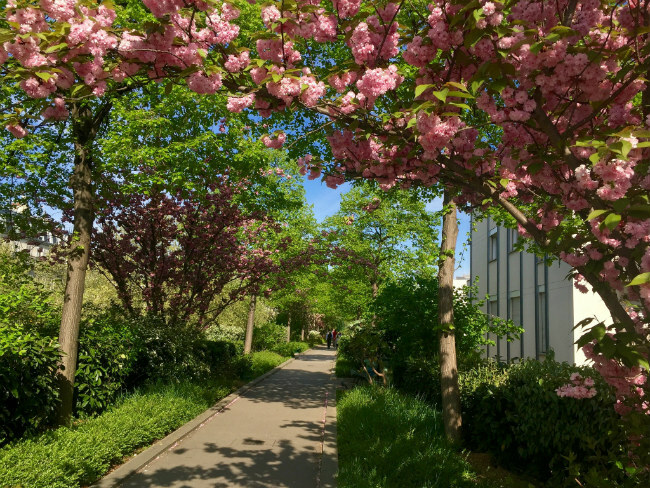 During March and April, the candy-floss colored petals sprout from the cerisier and magnolia trees in dozens of locations around the city. Best spots range from the Palais Royal and Notre Dame cathedral to the Champ de Mars and Trocadero, separated from each other only by the Seine. 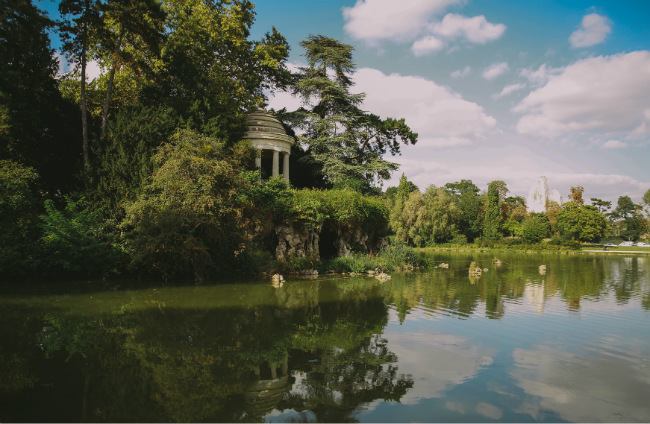 However perhaps the best-kept secret of all is the Parc de Sceaux, boasting spacious gardens and a fairytale chateau merely a few miles outside of Paris. Within the city limits, the Eiffel Tower is naturally the ultimate location for blossom spotting, but expect competition for camera space. Plus when you tire of photography, the tower’s top signature restaurant, Le Jules Verne, is due to relaunch this spring. — Chloe Govan is an award-winning writer and channel-hopping Francophile with a penchant for Parisian life. In my early years in the 12th district, I thought it was one island in the middle of Lac Daumesnil. In fact there are two, l’Isle de Reuilly and l’Isle de Bercy, connected by a footbridge. But then for years I thought the Lac was a real lake. It’s artificial, pumped with water from the Seine. The fish that swim there (and are sometimes landed by anglers) are real, however. The Lac Daumesnil is in the southwest corner of the Bois de Vincennes, near the Porte Dorée metro and tram stops. A path for strolling, jogging, or running circles the lake, and not far from it is an impressive Buddhist temple. The islets are easily reached, and in the springtime you can walk through verdure and flowers, or relax in an atmospheric grotto (artificial, of course). Sometimes in Paris, a little rain must fall. No matter when you’re visiting the City of Light, the weather here can change at the drop of an Elsa Schiaparelli hat. But showers don’t typically last long, so I recommend always packing your camera. Plus, completely agreeing with Gil Pender’s character in Woody Allen’s “Midnight in Paris” flick, the city is drop dead gorgeous in the rain. It’s true. Prior to your trip, study photos by the likes of Robert Frank, Brassaï, and Man Ray to see what I mean. You’d think Paris never had a nice sunny day. So why not embrace the rain? 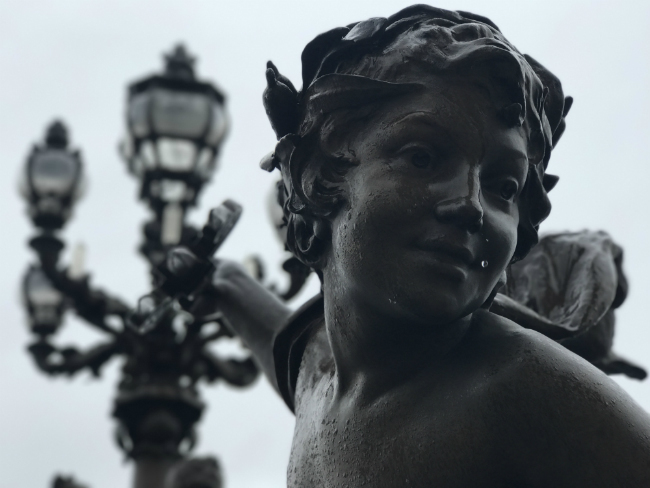 Soon you’ll be spotting weeping cherubs, tree branches rain glazed into sculptures, umbrellas left open to drip-dry in vestibules, miniature Parisian lap dogs decked out in head-to-tail rain gear, and maybe your own spiffy reflections in puddles between wet cobblestones. “Take the picture! Take the picture!” as Audrey Hepburn might say. One more tip for the misty rues: If you need a break from the rain or wind, it’s okay to hang out (and dry out) in a warm cafe with a coffee or a beer in a seat by a window—and keep shooting for hours. Nobody’s going to kick you out. It’s Paris, after all. As Henry Miller once penned, “The moment one gives close attention to any thing, even a blade of grass [or a parapluie rouge! ], it becomes a mysterious, awesome, indescribably magnificent world in itself.” The world in a grain of sand . . . or a drop of rain? 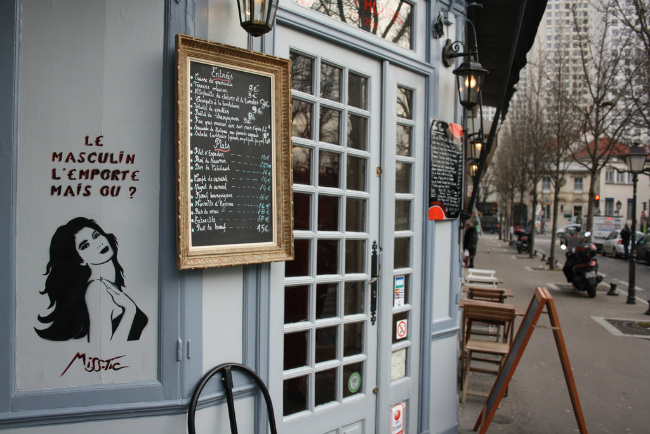 I have a soft spot for my Parisian village, the Butte aux Cailles in the 13th arrondissement. 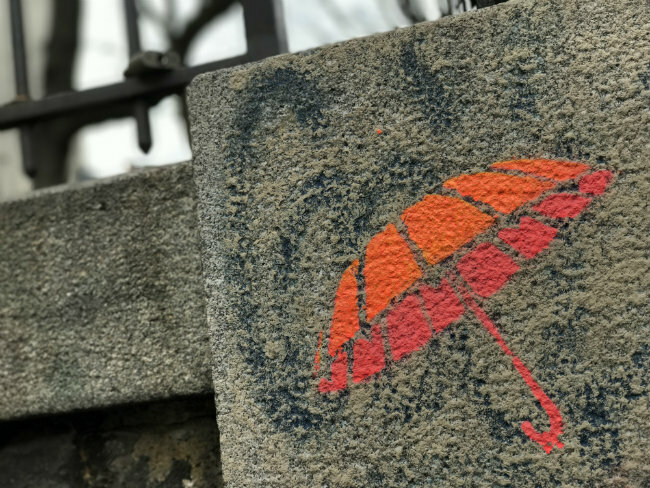 Clinging to a hilltop, this historic ‘hood is threaded with cobblestone alleys and adorned with street art (be on the look-out for Miss.Tic’s clever stenciled ladies and their poetic witticisms). The main drag is lined with cafés which get quite lively when the weather’s fine. Here you can grab a seat on the sidewalk, soak up the sun, and while away the afternoon over a coffee or a beer. –Mary Winston Nicklin is the editor of Bonjour Paris. Each year I spend a month in Paris and I normally aim to have that in March. 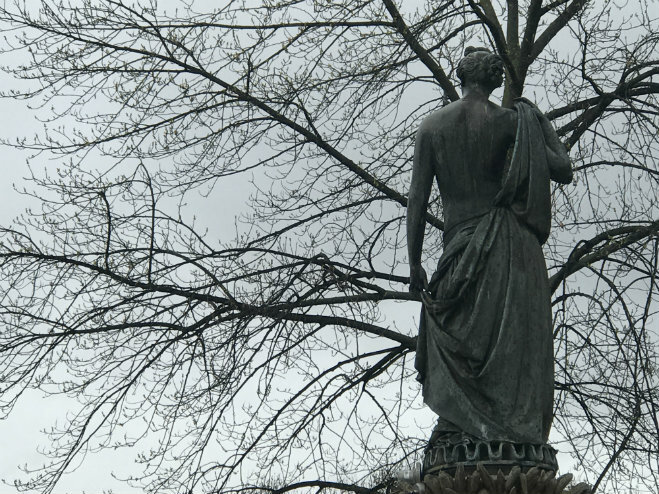 The winter months are ending and the plants in the Luxembourg Gardens, the Tuileries and all the tucked-away squares are in bud and about to burst into blossom. The air is different, the light clearer and café terraces begin to fill up– we are all coming out of hibernation. And so if there is any time of the year to be outdoors, I think springtime takes some beating. My morning starts with a café crème and a croissant outside Paul’s bakery in Rue de Buci in Saint-Germain-des-Prés, watching the sidewalk restaurants set up for the day and the pedestrians dodging the cyclists and the odd delivery van squeezing through the narrow street. Rue de Buci is always bustling. Or I’ll take the same breakfast on the tiny terrace of Boulangerie St Michel in Rue de la Huchette, which is just as satisfying with tourists spilling out of the nearby hotels eager to explore nearby Notre Dame and Shakespeare and Co. But today, the sun is shining and it just has to be a walk. The nearby Luxembourg Gardens may not be an original choice, but the gardeners are working flat out to plant new flowers and borders, the gravel paths are raked and the gardens look newly washed in the morning light. The runners are out circumscribing the park and the thwack of a tennis ball can be heard from the courts beyond the pond. The iconic green metal seats have my name on one of them (or two if I am lazy enough to put my feet up) and my book is in my hands, ready to look up from when a hungry pigeon lands at my feet in the expectation that I may have a sandwich as well as a book on my person. The museums and art galleries can wait another day. Today, I’m breathing in Paris in springtime. — Marilyn Brouwer is an established freelance writer and regular contributor to Bonjour Paris. As soon the the warm air blows in the promise of spring, head to the river just south of the Marais. With no set destination in mind, amble along the Seine, taking in the vibrant greens and budding blossoms. 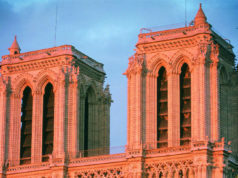 To the soundtrack of chirping birds and a cacophony of bells from Notre Dame Cathedral, allow yourself to be guided by the sun until it illuminates the sky in a dazzling light show. Hues of pinks unique to Parisian sunsets will mark the beginning of a season of leisurely picnics, evening promenades and apéros at river lined barges, Les Maquereaux and Péniche Marcounet. When spring arrives in Paris I like to finally start up running again (it’s much harder to stick to my schedule when the city is cold and dark!) and head out for a run on la coulée verte in the 12ème, an elevated walkway built on an old rail line, also called the promenade plantée. You can start at the entrance just behind the Opéra de Paris (Bastille) and run along the course, which follows Avenue Daumesnil. I usually loop back around once I’ve run over the bridge at the Jardin de Reuilly but apparently you can go until the Bois de Vincennes and Porte Dorée! If running isn’t your thing then it’s also just a really nice spot for a walk. Not only does it offer some rare greenery in the center of Paris but you also get a unique perspective of the surrounding architecture from being high above the street, and there is always a great mix of Parisians out and about; other runners, families out walking, occasionally even people doing yoga in the sunshine. You can also leave the route at various points, perhaps taking the stairs down to the Jardin de Reuilly, or stopping off for a wander around the Marché d’Aligre. With the first rays of spring sunshine, the light changes and, with new Adidas and attitude, we’re ready to walk the city’s 20 arrondissements with curiosity, admiration and joy. We’ll discover little alleys, a hidden market, tempting bars, galleries, boulangeries and chocolate shops. 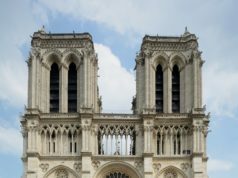 We did, staring up in wonder at the flamboyant Gothic style tower, built – said the information at the iron gate – between 1509 and 1523. The only remaining vestige of the église Saint-Jacques-la-Boucherie destroyed in 1797. The marble statue of Blaise Pascal, mathematician, physicist, inventor, writer and Catholic theologian, at the base of the tower, is a reminder that it was here he began his barometric experiments continued on a mountain top at Puy-de-Dôme. At the northwest corner, a statue of Saint Jacques le Majeur dominates the platform where a small meteorological station, belonging to the Observatoire de Montsouris, was established in 1891. The sculpted symbols of the four evangelists (the lion, bull, eagle and man) appear on the corners. These statues were restored during the last century, along with gargoyles and 18 statues of saints decorating the tower walls. 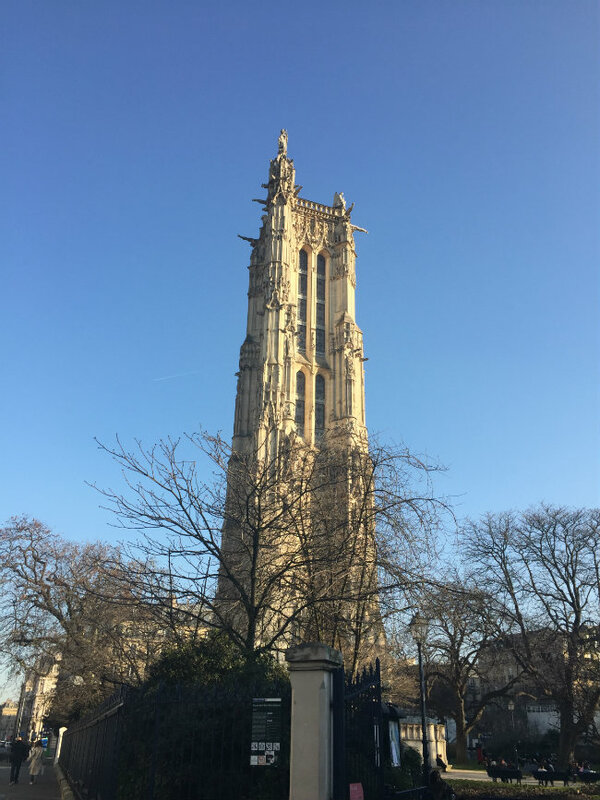 That’s Paris in the Spring – next time we’ll climb the 52 meters/300 steps the top of the tower! 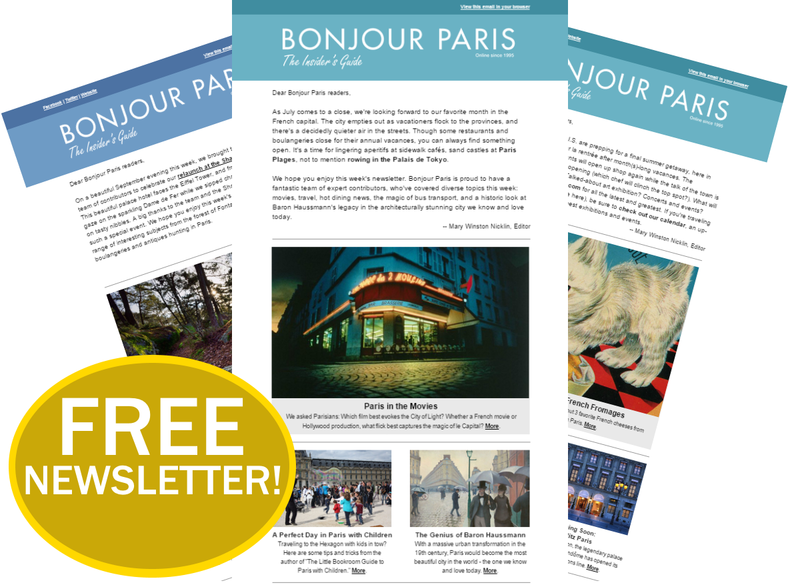 — Margaret Kemp is a regular contributor to Bonjour Paris. One of my favorite things to do when spring arrives in the city is to take advantage of the warmth and sunshine to go read in one of my favorite places to read in the world–the Luxembourg Gardens. It is an even better place to read now, since one of the most wonderful bookstores in Paris, the Red Wheelbarrow, has recently reopened right across the street from the park, on the rue de Medicis. If you don’t know what you feel like reading you can ask Penelope Fletcher, who runs the store, for help. She always has great ideas! Then you can take your new books into the park, find a comfortable chair somewhere, and sit there reading to your heart’s content–surrounded by lots of Parisians doing the same thing! My faviorite place to sit, people watch and read when I am in Paris is the Place des Vosges. It is such fun to see children running, nannies pushing baby carriages, students sitting on the grass drawing. 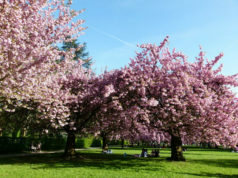 Thank you fr this incredibly wonderful article full of new ideas for enjoying springtime in Paris! !